Real-time readings? Yes, with a scan of the sensor No, blinded to the patient. Retrospective. *Glucose readings are not available during 12-hour warm-up, when sensor is too hot or too cold, when you see an error or "LO" or "HI" message, or no current glucose reading. †The FreeStyle LibreLink app and the FreeStyle Libre and FreeStyle Libre 14 Day readers have similar but not identical features. Fingersticks are required for treatment decisions when you see Check Blood Glucose symbol, when symptoms do not match system readings, when you suspect readings may be inaccurate, or when you experience symptoms that may be due to high or low blood glucose. ‡If you want to use your reader, you must start the sensor with the reader first. 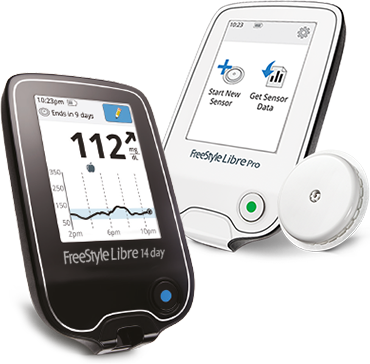 Remember that FreeStyle LibreLink and FreeStyle Libre and FreeStyle Libre 14 Day readers do not share data. For complete information on a device, be sure to scan your sensor every 8 hours with that device; otherwise, your reports will not include all your data. §The FreeStyle LibreLink app is compatible with iPhone 7 and later running iOS 11 and later. ‖The user must be connected to data services for glucose data to automatically upload to LibreView. #Participating pharmacies are subject to change without notice. ** The FreeStyle Libre and FreeStyle Libre 14 Day systems cannot be used interchangeably.